No need worrying about the bulkiness or transportability of this steel commode-just simply fold it for easy storage or transport. The Folding Steel Commode easily opens and closes, then fold flat for convenient storage and transportation! 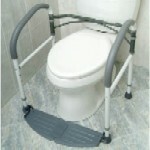 Ideal for bedside or chair side commodes that you don't want out all of the time, or need to take with you! Traditional steel commodes do not allow the user the flexibility that this folding commode does. Grey powder coated steel welded construction increase stability, security, strength and durability. Comes with a 7.5 quart commode bucket, cover and splash shield. 250 lb. weight capacity. Limited lifetime warranty. Product weight is 15 lbs. 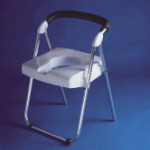 "Requiring no permanent installation, the Buckingham FoldEasy Toilet Frame will give you the solid and secure handholds you need when sitting down or rising from the toilet. Portable and transportble." 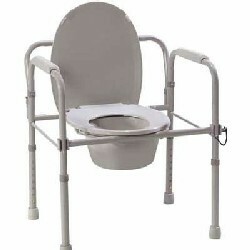 Designed for commode users with an active lifestyle. You can take the Voyager Folding Travel Commode with you! Light and small when folded, but very strong and sturdy for use.